Clarinet in B-flat (Violin), Viola and Piano. Composed by Robert Schumann. Edited by Ernst Herttrich. Arranged by Klaus Schilde. Sheet music. Henle Music Folios. Classical. Score and Parts. 51 pages. G. Henle #HN917. Published by G. Henle (HL.51480917). No romantic poetry or concrete fairytale figure inspired Schumann to write his opus 132. Today, we can assume that the title of the pieces, originally called Romances, was merely supposed to conjure up a poetic and fairytale world. 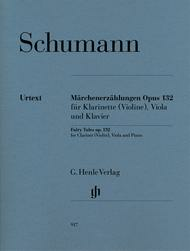 Presumably inspired by Mozart's “Kegelstatt” Trio K. 498, Schumann occupied himself intensively with plans for a work for this distinctive combination of instruments, whose “unique effect” enthused him. Yet almost three years passed before he sent a publisher these works that he had “written with great pleasure”. The first edition contained a violin part as an alternative to the clarinet. 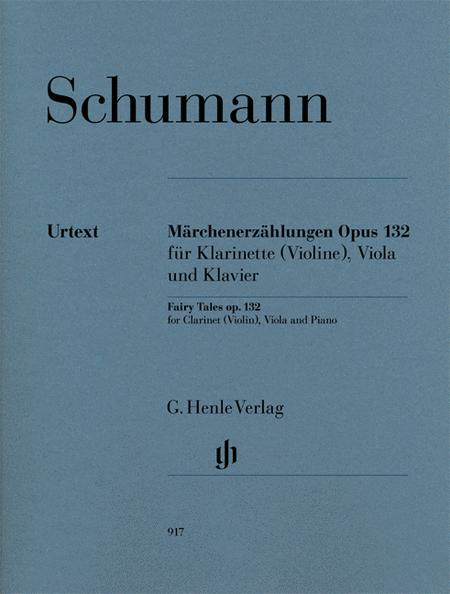 As this part was authorized by Schumann, it is also included in this Urtext edition.